Out of all that comes the deepest most profound question since time began. Do the socks have the jolly wrencher on them? I doubt they’d put their competitor’s logo on a prize for their contest. They probably shot the other guy that was checking hackaday out. Dictators be like that sometimes. They may have just tried to use pressurized PVC. As for that spanish scooter, if you drove one of those here you’ed be fined for driving an uninsured vehicle, say goodbye to $2000! And I hear the wifi in north korean labour camps is terrible. Sorry to hear about your declining numbers in the DPRK. Hope this doesn’t foreshadow other bad news here! Wait a minute!!!? VCF West _before_ VCF East? I wonder who pulled of that good idea. And I didn’t arrange it. 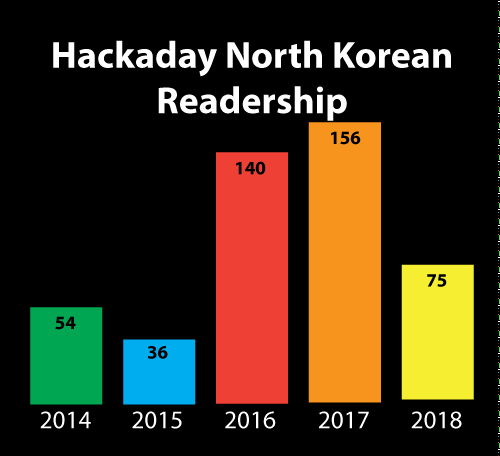 So ~50% of HAD’s 2017 DPRK views switched to VPN? Jusr commenting this before any angry galicians find out: it’s “Galicia” not “Galacia”. Just in time! My granny is galician.